Right before we left, I made a sun-dried tomato vinaigrette for a pasta salad that I was going to eat in the car. Grilled chicken, whole wheat penne, baby spinach… I take road trip food very seriously. With the leftover dressing, I made this potato salad. Creamy fingerlings are gently simmered until just tender, and then cooled before slicing. 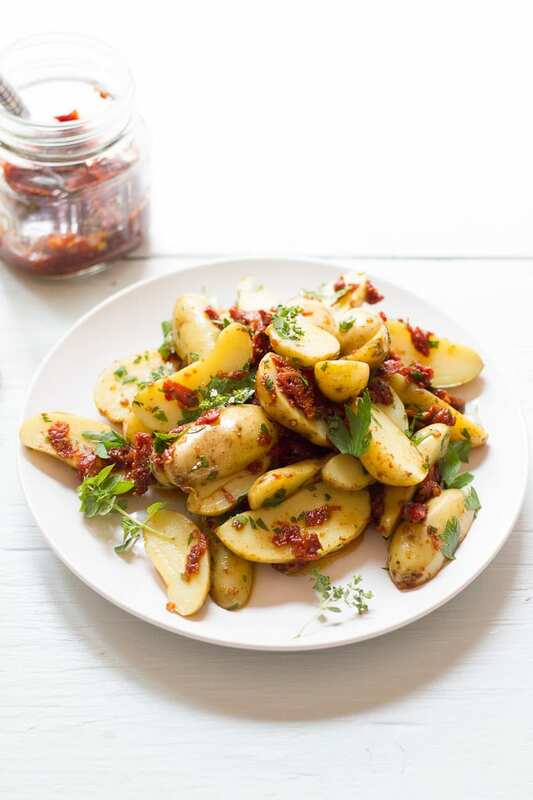 The potatoes are tossed with dollops of rich, sun-dried tomatoes which happen to be quite thick (almost like a paste). A heavy hand blankets the dish with fresh summer herbs. Really get in there and make it good; add a bit more vinegar, seasoning, and herbs as you like. What you don’t see pictured here, are the blanched green beans that I added at the last minute for dinner- that’s a good one. *Taste this salad as you go, adding a bit more vinegar, seasoning, and herbs if you like. 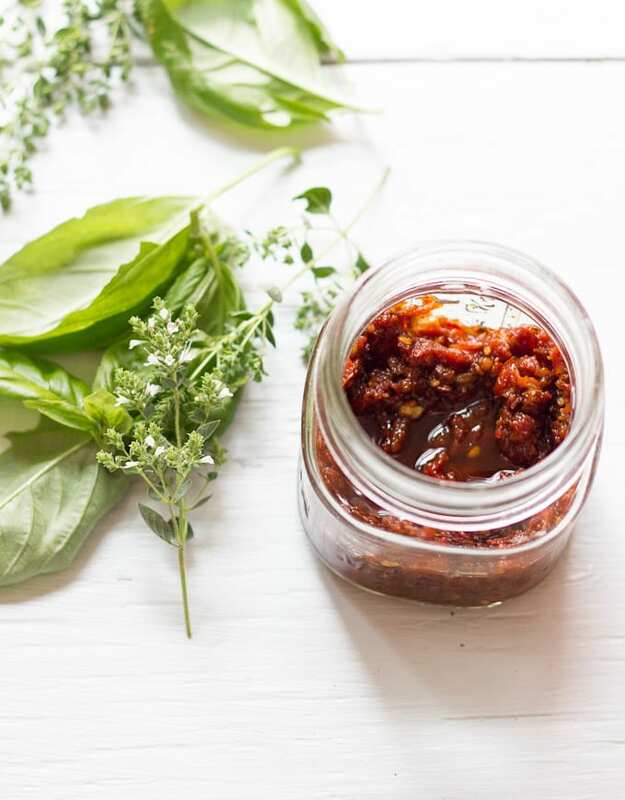 To make the vinaigrette, add all of the ingredients to a mini food-processor or blender. Add 1 tbsp. of oil from the jar sun-dried tomatoes. Run the machine until blended; the mixture will be chunky. Season with salt and pepper. Set aside. Place the potatoes into a pot, and add just enough water to cover. Bring to a gentle boil and then reduce the heat to low. Simmer for about 20 minutes, or until a potato easily releases when pierced with a pairing knife. Drain and set aside to cool. Slice the potatoes in half lengthwise, and place into a large bowl. Add dollops of tomato vinaigrette and toss gently with a large spoon. 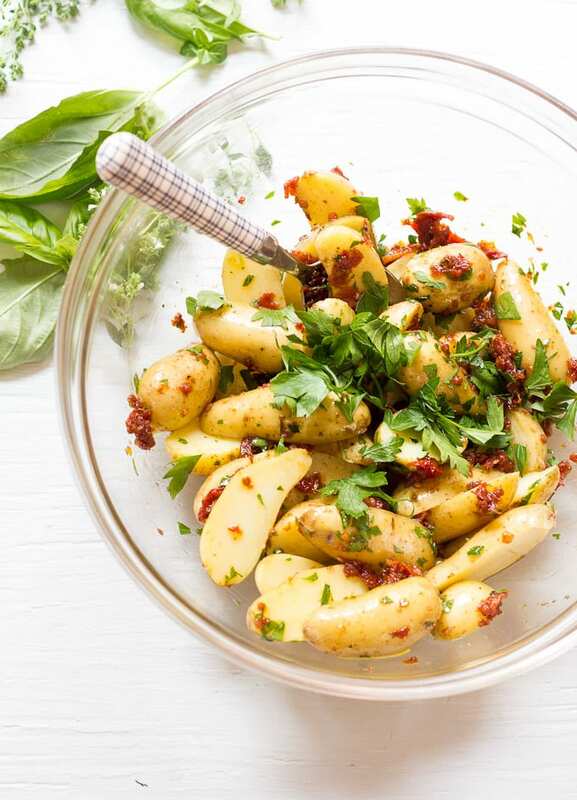 I love fingerling potatoes and that dressing sounds so good! 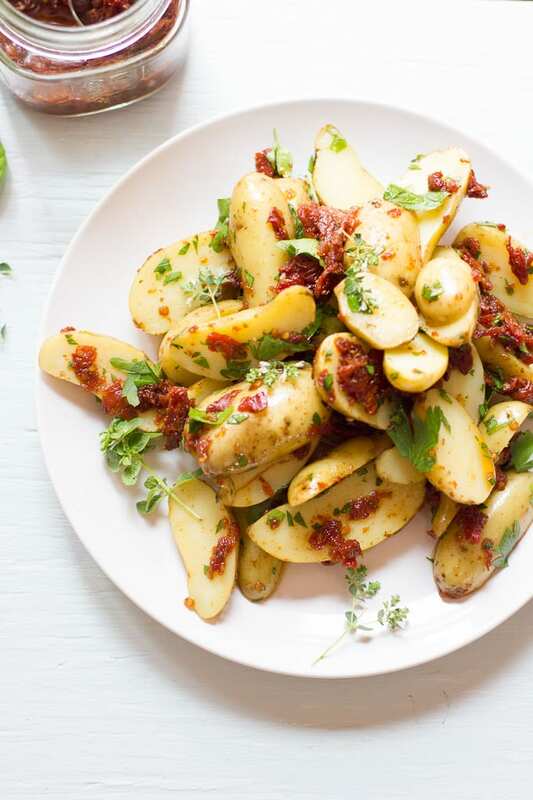 These potatoes are seriously now on my list of things to try asap! Love this salad!!! And you could do so many variations as well. I especially love that you added basil to the dressing, to freshens things up. Gorgeous!!! Have a great vacation! I’m so impressed by your road-trip food. This potato salad is different and delicious looking! I love those little potatoes, and this sounds delicious, and it looks fabulous. Have a wonderful vacation!